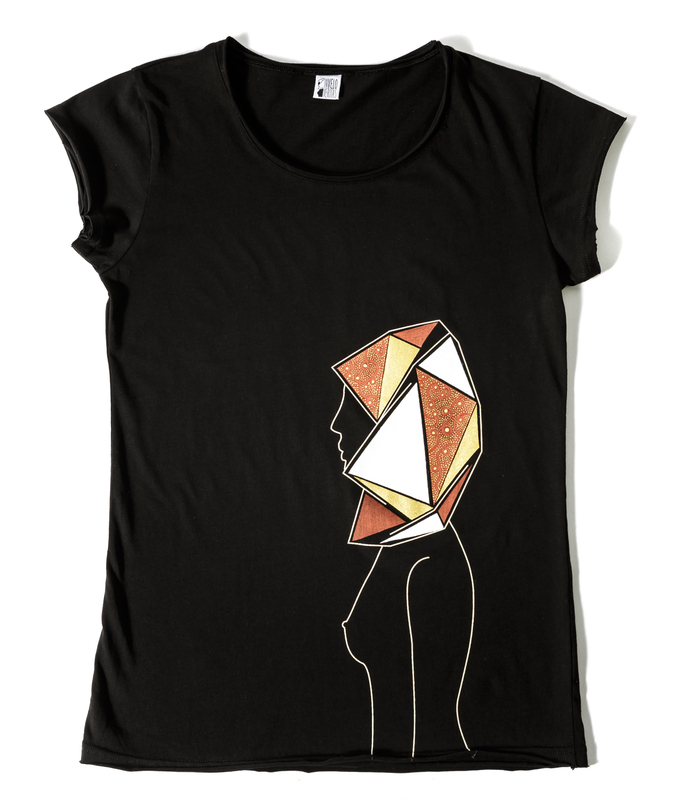 This exclusive Inveloveritas T-shirt features a distinctive stylised profile of a naked woman wearing only the traditional headgear of the typical costume of Orgosolo, a village in the centre of Sardinia, elegantly synthesised and finely hand-painted on silk screen. 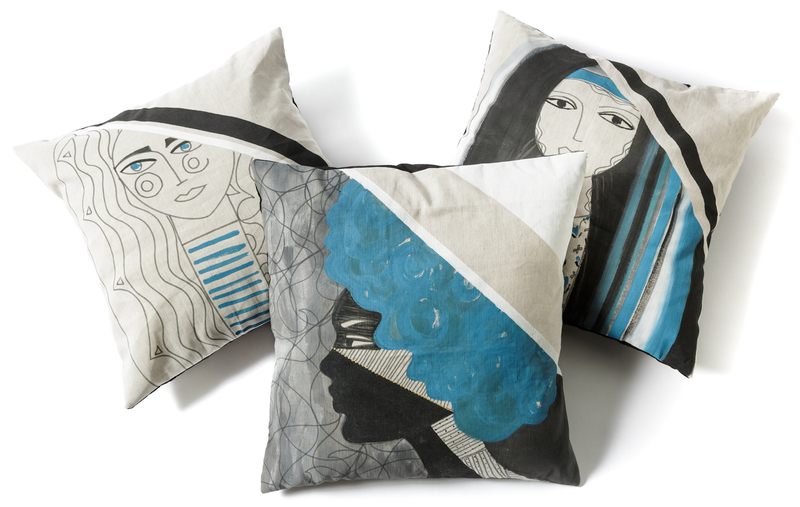 Hand-painted with black and blue bright pictorial brush strokes against a neutral background, these cushions with stylised faces of women stand out for their artistic and at the same time clear-cut and decorative style, characteristic of the innovative production of Inveloveritas. 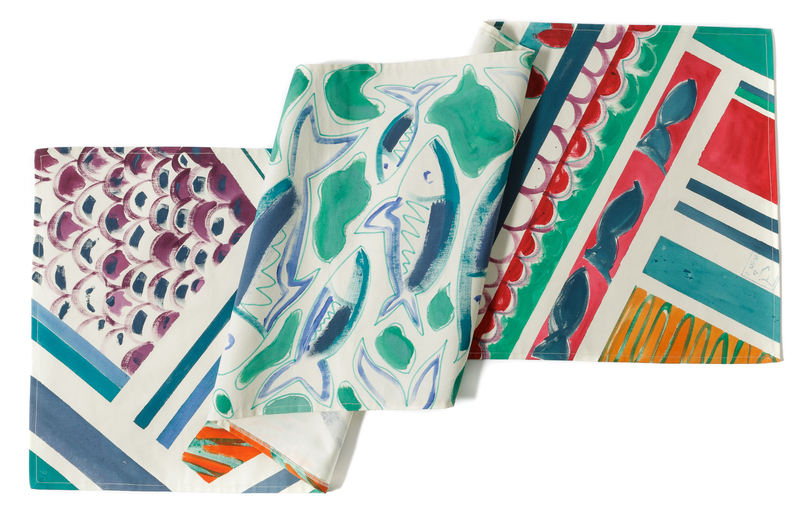 The decorations of this hand-painted table runner are evocative of oneiric marine themes, rendered with water-green and coral brush strokes. It is part of the line of accessories and home décor that stand out for their characteristic hand-painting by means of vibrant brushstrokes and colours. 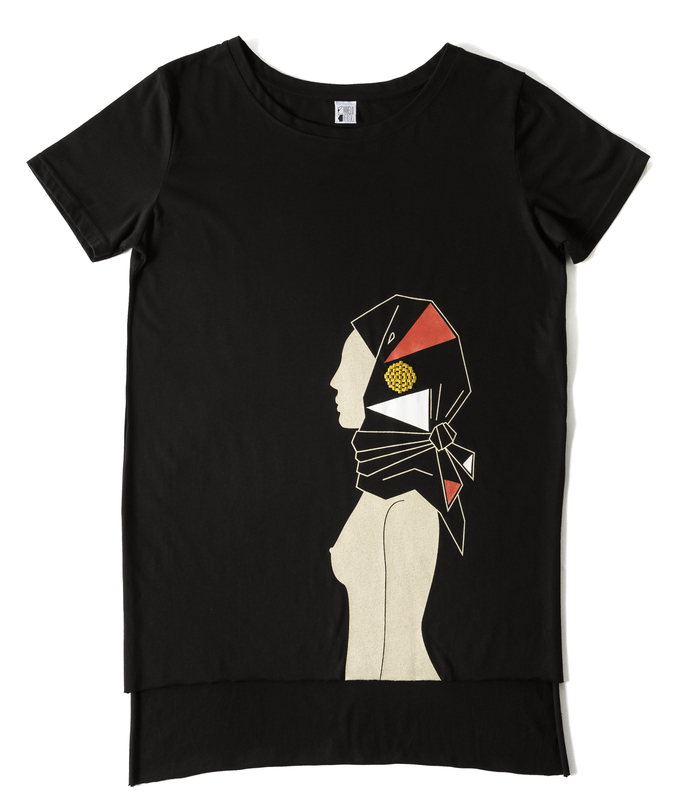 This exclusive Inveloveritas black T-shirt features a distinctive stylised profile of a naked woman wearing only the traditional headgear of the typical costume of Nurallao, a village in southern Sardinia, elegantly synthesised and finely hand-painted on silk screen base. Inveloveritas is a contemporary project by the young creative talents Maria Francesca Maniga, a young woman from Sassari coming from the fashion industry, and the multifaceted artist Giuseppe Scalas, from Assemini, a small town on the outskirts of Cagliari, aimed at producing neatly defined artefacts reflecting the true sense of traditions. Drawing on the veil and the different concepts of the same present in the different cultures, they were then inspired by the shawls and headgear of the elegant and multifaceted costume of Sardinian tradition, reproducing, by hand-painting following serigraphic procedures, the silhouette of a female body wearing only a veil which is highlighted with ever-changing aesthetics. Their intention is to re-integrate the veil element by stripping it of prejudices. This main theme, which has become their distinctive feature, has also led to new productions following an innovative path characterised by novel interpretations of the local traditions. Their workshop, Inveloveritas Temporary Lab, in the Marina district in the historic centre of Cagliari, expresses the wish to experiment and open up to artistic contamination and collaborations, in line with the philosophy of these two creative talents who consider art and fashion as forms of expression and social inquiry. 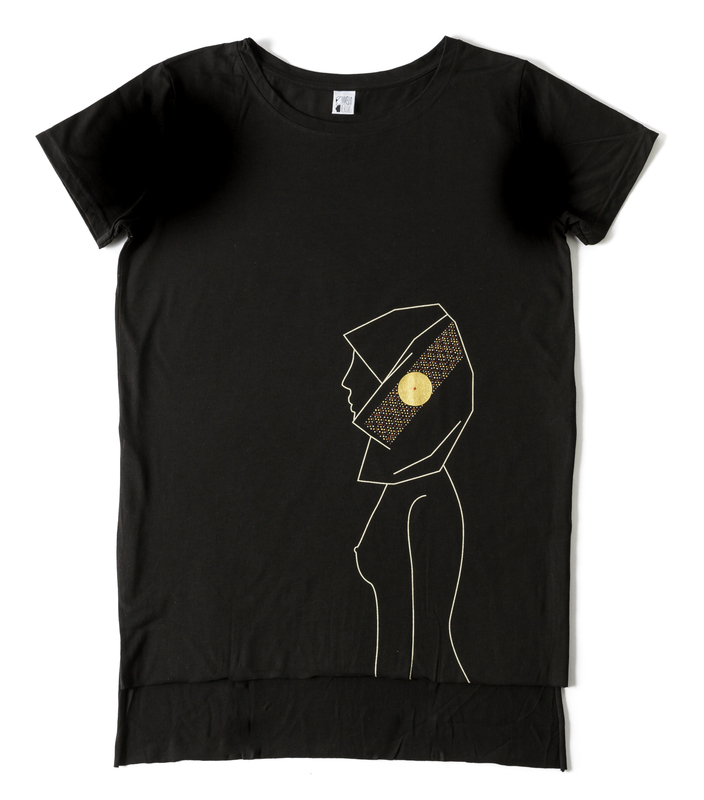 The minimal t-shirt, hand painted on silk-screen printing of the naked female profile wearing the traditional veil, is undoubtedly the most distinctive item of the Inveloveritas production, proposed as a unique garment - ever-changing with respect to the design and craftsmanship process, enriched by digital embroidery and hand-painting. In addition to the T-shirt collection there are new lines of furnishing accessories, table runners and cushions, invariably characterised by a neat graphic design complemented by hand-paintings with vibrant brush strokes and colours. Beside the more artisanal productions, other lines are realised with the support of innovative technologies, as is the case of the large headscarves, ‘Cadore, produced in a limited edition and inspired by the typical traditional large shawls. Individual projects and productions are the result of collaborations that express their social commitment. Starting from the original concept and design, Inveloveritas produces its items spanning and exploring various types of traditional and innovative tools, techniques and materials, with the prevalence of hand-painting on fabrics combined with artisanal silk-screen printing, vectorial drawing and digital embroidery.